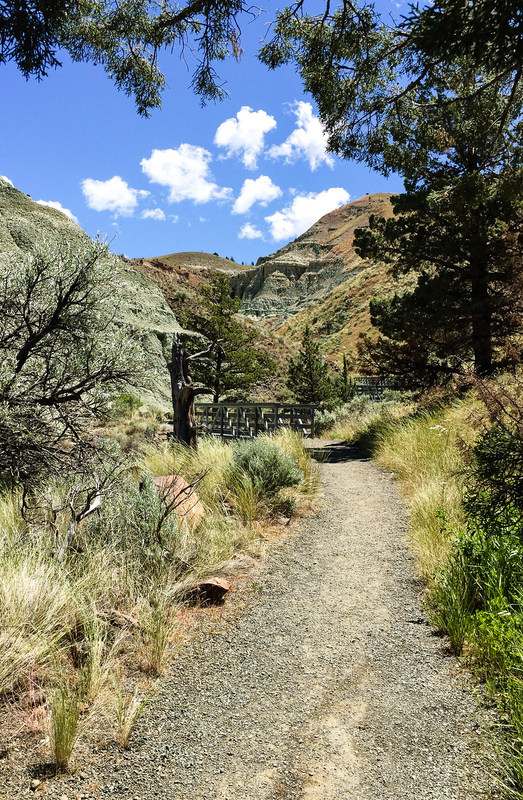 If you’re looking for an off-the-beaten-path travel experience in Oregon, John Day Fossil Beds National Monument more than qualifies. Road tripping in the remote, rural countryside of eastern Oregon’s John Day River Basin is a visual treat. But fossils, hidden in the region’s rock layers, are the true star of this trip. And you’ll unravel their story at a treasure of a national monument filled with paleontology discoveries, geological formations and hiking opportunities. Well-preserved layers of geological history in the John Day River Basin are the result of climate and naturally caused changes. Entire species like the three-toed horse and short-faced bear became extinct due to these events. A series of volcanic eruptions, starting about 44 million years ago and lasting until about 7 million years ago, trapped plants and animals in layers of lava and debris flows. And the climate evolved from a humid, swampy forest to arid steppes. The end result? A fascinating picture of the past waiting to be revealed. When Alan and I explored Oregon on a road trip that included Journey Through Time Scenic Byway, John Day Fossil Beds was part of the fun. A one-day visit can’t do justice to this 20-square-mile national monument with 44 million years of natural history hidden in its rocks and geological features. So we concentrated on a small portion of the Sheep Rock Unit. For easy access to the Sheep Rock Unit of John Day Fossil Beds National Monument, we recommend staying at Best Western John Day Inn in John Day, OR. Visiting Thomas Condon Paleontology Institute is a must! Following the advice of Tim Bishop, Baker County Tourism, Alan and I made the Thomas Condon Paleontology Institute our first stop. 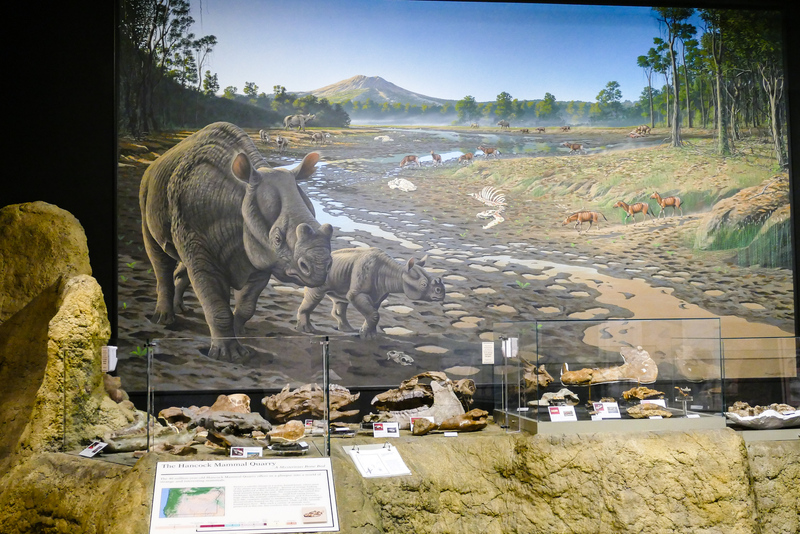 The combination visitors center and national park research facility offers a first-class look at plant and animal evolution during the Tertiary Period. Are you thinking, oh no, this sounds sort of boring? Wrong. The incredible displays at Thomas Condon Paleontology Institute. Entering the display of over 500 fossils is like taking a time machine back millions of years. The fossils are placed in diorama settings that recreate the sights and sounds of the era. Stunning life-like murals, painted by artists, but based upon scientific research, lend an “I am here” quality. Soundtracks of what the animals might have sounded like accompany this walk through time. Any moment, I expected a saber-toothed tiger to come slinking out of the semi-tropical swamp. It feels that real. 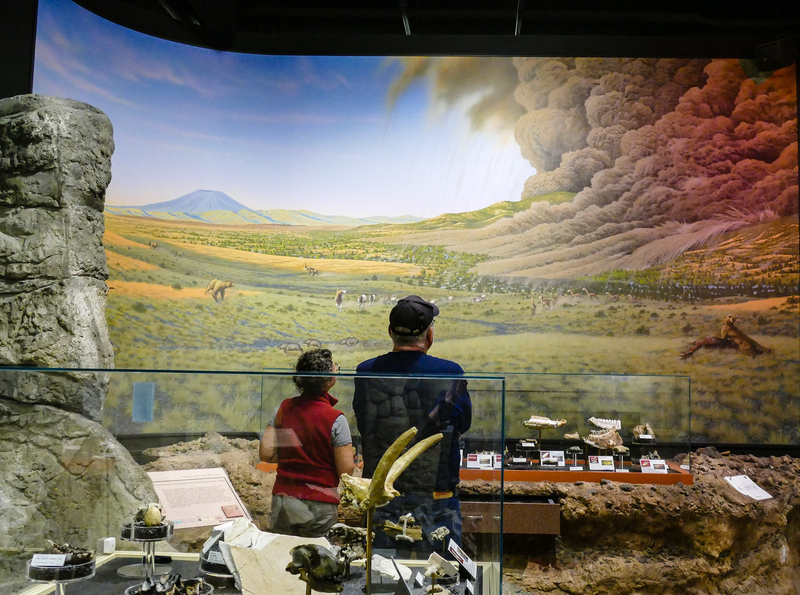 In addition to the world-class fossil exhibit, visitors to the Thomas Condon Palentology Institute get a first-hand look at scientists working to uncover the secrets held in the rocks of John Day Fossil Beds. In the lobby, a window looks into the paleontology lab. A large screen on the lobby wall provides a webcam view over one of the worktables in the lab. If you’re lucky, a paleontologist will be brushing away millions of years of dusty stone to reveal another fossil treasure. Want to take a look? Check the park’s webcam page for links to the lab webcam broadcasts and another webcam view at Sheep Rock. The visitors center also hosts a movie, which Alan and I didn’t watch as the day was heating up and we still had a trail to hike. At Blue Basin, we chose the 1.3-mile-round-trip Island in Time trail. The environment feels eerily similar to deserts in the Southwest U.S. The mostly level path travels along the canyon floor ending with a vista of blueish-green canyon walls. 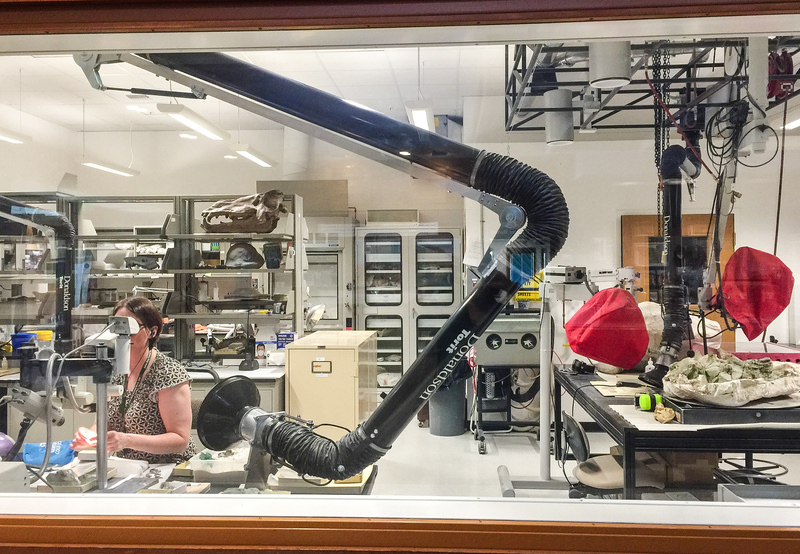 Exhibits of fossil replications are placed along the way. Looking at them lends an appreciation for the keen eyes and knowledge of those who actually find fossils in the wild. With an earlier start, we would have hiked the more strenuous Blue Basin Overlook Trail. The hike climbs 760 ft in elevation, looping 3.25 miles around the steep badlands formations of Blue Basin. And, yes, fossils still hide in the layers of rock. 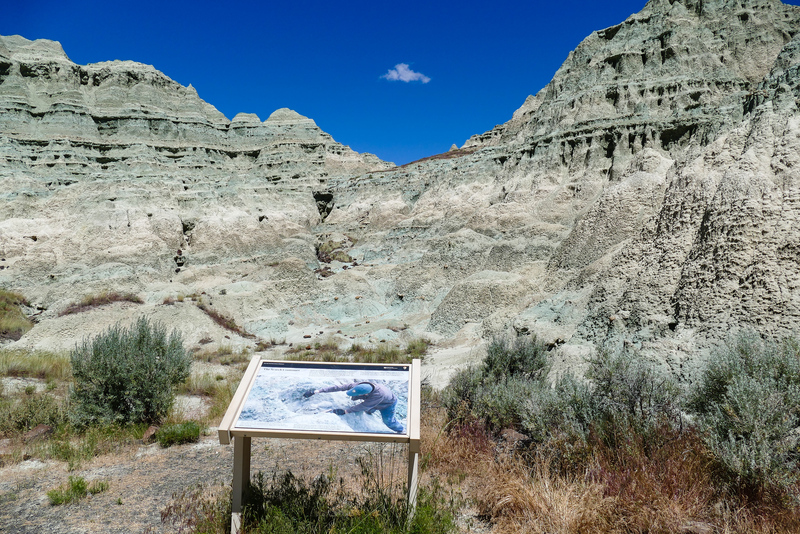 John Day Fossil Beds National Monument consists of three units. Alan and I spent our too-short visit in the Sheep Rock Unit, where natural erosion still reveals vertebrate fossils dating back to 32 million years ago. Fossil from the Hancock Mammal Quarry in Clarno Unit of John Day. The Clarno Unit, 18 miles west of Fossil, Oregon, is home to the Clarno Palisades, once an ancient jungle. 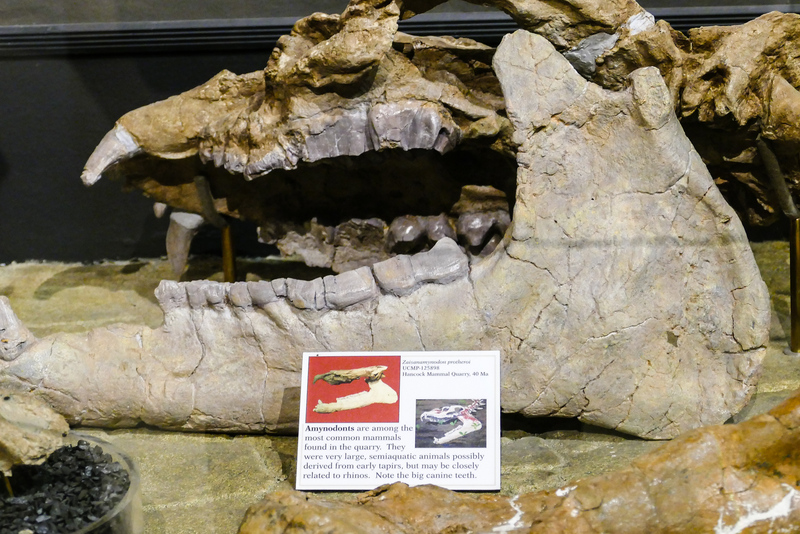 The rhino-like brontotheres, crocodilians, and meat-eating creodonts have been found in the rocks along with a diverse representation of plant life. At the Painted Hills Unit, 9 miles northwest of Mitchell, Oregon, the orange, tan, black and red-striped hills are a photographer’s delight. We’d like to visit to photograph sunset here. The colorful layers of Painted Hills catalog a sequence of volcanic eruptions. And the leaf fossils that have been found date back to 39 million years ago. Lodging is limited so book before you go. Start your search with us. There is little to no cell phone service. Fuel up often. Gas stations are few and far between and most are not open at night. Oregon requires attendants to fill your tank. And although the law has been amended to allow self-fill in rural areas, many of the local stations have not replaced tanks that allow you to fill your own tank. Our visit to John Day Fossil Beds National Monument has inspired the desire to return for a deeper exploration. What a boomer road trip that’s going to be! 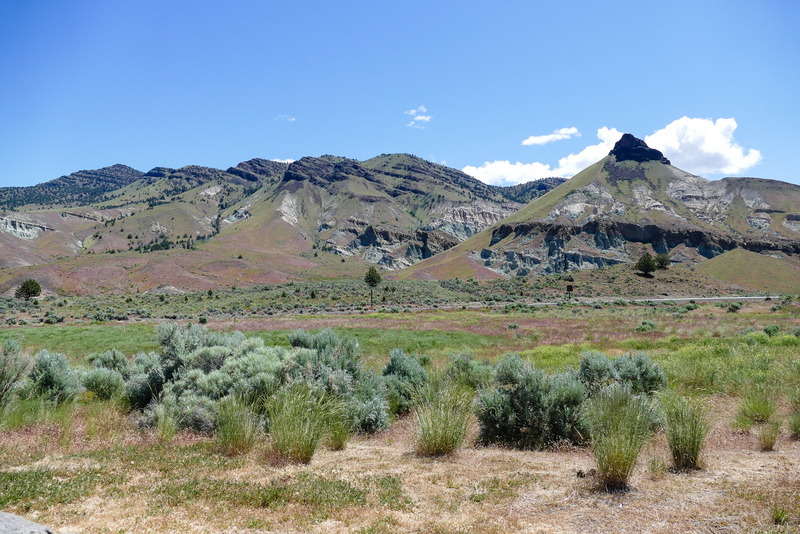 Have you visited John Day Fossil Beds? Come join the conversation at the My Itchy Travel Feet page on Facebook. Or send us an email with your thoughts.